I often feel a bit of a hypocrite in the mornings as I make my daughters their porridge for breakfast. I’ve never been able to eat the stuff you see. 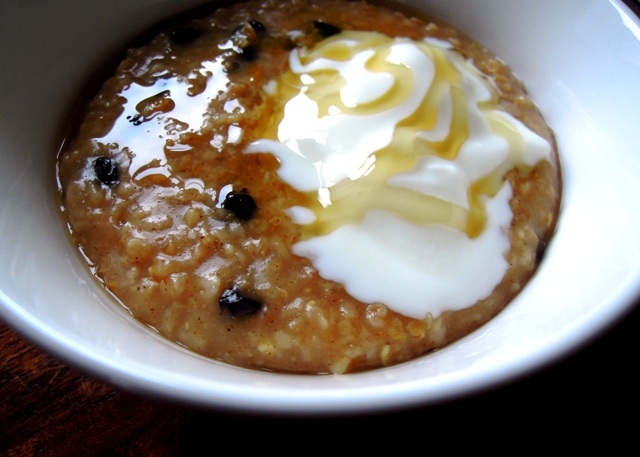 I love the idea of it; a big steaming bowl of hot porridge sounds the ideal way to set you up on a chilly day. And it’s just so good for you. You digest porridge slowly, so it fills you up for longer. High in fibre, oats are proven to prevent heart disease, lower cholesterol and boost serotonin. My problem is the hot milk. I’m not good with hot, milky things and have never been able eat rice pudding or semolina. Even with hot chocolate I have to be in just the right mood, and it must be really good quality chocolate to distract me from the milk. And if there’s any skin on top – urrrgghh! Lots of people have suggested ditching the milk and making porridge with water instead. But that’s always sounded rather mean and stingy to me. Then I came across an item in Runners World (can’t believe I mentioning that particular publication again!) which suggested using apple juice. Why had I never thought of that myself? Porridge made with apple juice is my new favourite breakfast. It’s absolutely delicious and I feel just so virtuous eating it. I add currants, giving it a lovely crunchy fruitiness and mix in a little cinnamon, which of course goes so well with apple. Then I serve it with a decent dollop of yoghurt and a squeeze of runny honey. Perfect! The children like it too. But my husband’s a traditionalist and is sticking with his milk. I don’t have that much time in the mornings, so I make my porridge in the microwave. Simply put the oats, juice, cinnamon and currants into a microwaveable bowl, give it a good mix and place in the microwave. Cook on medium power for a couple of minutes and then stir. Cook again for another two, maybe two and a half minutes, until you’ve got the porridgy consistency you’re after. I like mine pretty thick. Serve with a generous spoonful of yoghurt and lots of lovely honey. Yum! 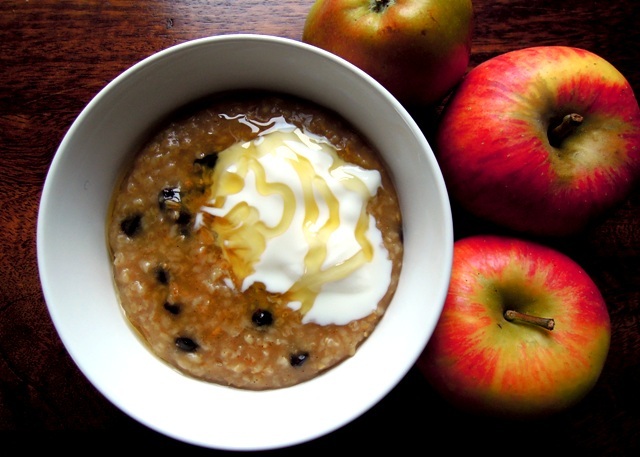 I use almond or coconut milk to make my oatmeal, but I love the idea of apple juice! Adding flavor and sweetness all at once. Yum! Apple juice is great for that lovely soft sweet flavour. But I do also like the idea of using almond milk – wonder if that will help with my ‘thing’ about hot milk? Looks like just the thing to warm us up on these cold mornings. I’ve mixed oats or oatmeal with apple juice (and sometimes grated apple) and left in the fridge overnight, then added some yoghurt – leaving it overnight seems to add a creaminess to the texture. But this looks like a much more wintry alternative, perfect for Feb. Brilliant! Like you, I’ve always thought porridge was probably a good idea but really don’t like milk – especially hot. Thank you, now I can finally try a bowl of porridge for breakfast! I really don’t ‘do’ porridge. I’m scarred from my childhood when my mum used to make me sit at the table and force me to eat it until I retched. (Sorry, a bit too much information there!) But the apple juice thing is making me think maybe, just maybe, I could eat this after all. You know, I really didn’t realise porridge was such an emotive subject! I so hope you might give porridge with apple juice a go. It is so different from milky porridge, which I absolutely detested. If you do try it, I’d love to know what you think! I want this for my breakfast!! What a great idea to use apple juice. It’s going on my list…. I’m so glad you like the sound of the apple juice. It really works for me. The magazine article I read also suggested using cider, which I’m not quite so sure about – especially for breakfast!